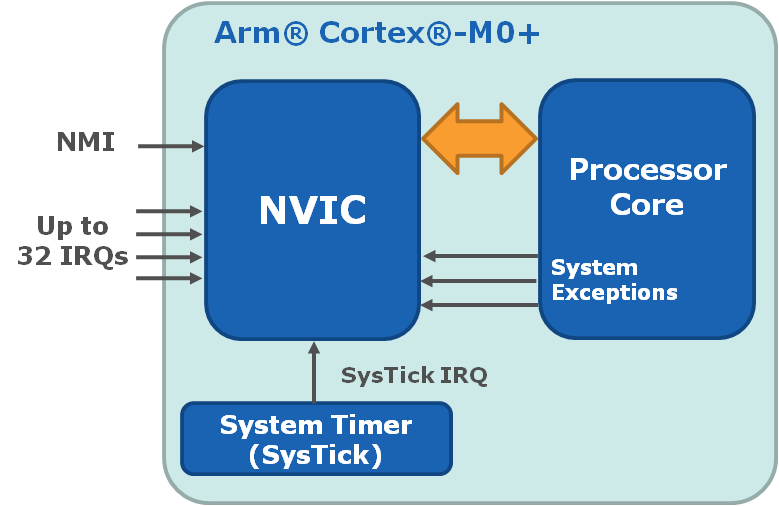 This section covers the basic coding steps required to configure/use the SysTick timer module found in the CPU core of SAM C21 MCUs. The system timer consists of four registers (CTRL, LOAD, VAL, CALIB) which are defined in the CMSIS-Core header file core_cm0plus.h. These registers are located in the SAM C21 System Control Space (SCS) memory region, beginning at address 0xE000E010. When enabled, the 24-bit timer counter counts down from the value in VAL. When the counter reaches zero, it reloads the value in LOAD on the next clock edge. It then decrements on subsequent clocks. This reloading when the counter reaches zero is called wrapping. When the counter transitions to zero, it sets the COUNTFLAG status bit to '1'. If the TICKINT bit is set, an exception may be generated. Reading the COUNTFLAG status bit clears it to '0'. Therefore, the SysTick Interrupt Time Period = (LOAD + 1) * CLK Period. Writing to VAL clears both the register and the COUNTFLAG status bit to zero. This causes the SysTick logic to reload VAL from LOAD on the next timer clock. A write to VAL does not trigger the SysTick exception logic. Reading VAL returns the value of the counter at the time the register is accessed. Writing a value of zero to LOAD disables the counter on the next wrap. The SysTick counter logic maintains this counter value of zero after the wrap. The 24-bit counter is clocked by either the CPU clock (AHB clock) or an implementation-defined Reference Clock. The clock source is set by the CLKSOURCE and NOREF flag bits. Current SAM C21 errata indicates that the Reference Clock is un-implemented and that you should configure the SysTick clock source to be the CPU Clock (CLKSOURCE==1). SysTick_CTRL is a control and status register which configures the SysTick clock, enables the counter, enables the SysTick interrupt, and indicates the counter status. COUNTFLAG: Indicates whether the counter has counted to 0 since the last read of this register. COUNTFLAG is set to '1' by a count transition from 1 to 0. COUNTFLAG is cleared to '0' by a read of this register, and by any write to the Current Value register. CLKSOURCE: Indicates the SysTick clock source. If no reference clock is provided, this bit reads as '1'and ignores writes. TICKINT: Indicates whether counting to 0 causes the status of the SysTick exception to change to pending. Changing the value of the counter to '0' by writing zero to the SysTick Current Value register (SysTick_VAL) never changes the status of the SysTick exception. ENABLE: Indicates the enabled status of the SysTick counter. SysTick_LOAD is a counter (re)-load value register. This provides the wrap value for the counter. RELOAD: The 24-bit value to (re)-load into the current value register (SysTick_VAL) when the counter reaches 0. SysTick_VAL is the counter current value register. CURRENT: Current counter value. This is the value of the counter at the time it is sampled. 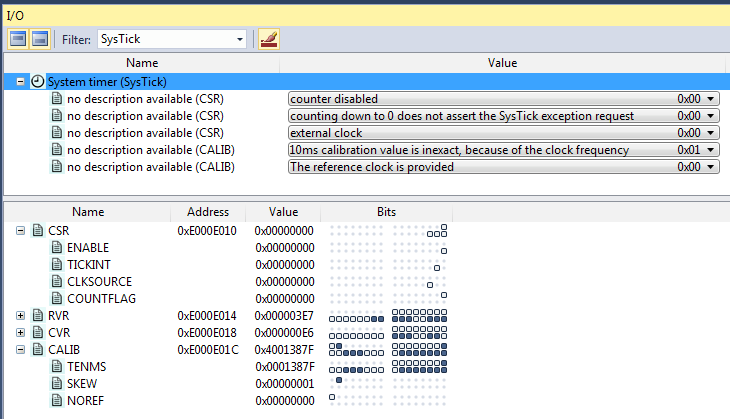 SysTick_CALIB is calibration value register. This indicates the preload value required for a 10 ms system clock. NOREF: Indicates whether an IMPLEMENTATION DEFINED reference clock is provided. When this bit is '1', the CLKSOURCE bit of the SysTick_CTRL register is forced to '1' and cannot be cleared to '0'. SKEW: Indicates whether the 10 ms calibration value is exact. TENMS: Optionally, holds a reload value to be used for 10 ms (100 Hz) timing, subject to system clock skew errors. If this field is zero, the calibration value is not known. The current SAM C21 errata indicates that the CALIB value is incorrect. Therefore, this value should not be used to initialize the Systick RELOAD value register, which should be initialized instead with a value depending on the CPU clock frequency and on the tick period required by the application. SysTick configuration is also supported via available CMSIS functions in the core_cm0plus.h file. The following code example uses the SysTick_Config() function, which initializes SysTick and its interrupt (priority level = 3), and starts the timer. The counter is in free running mode to generate periodic interrupts.